ORANGE COUNTY, California-October 10, 2017- SpaceFab.US is a new space startup company working on space telescope satellites, asteroid mining, and space manufacturing. The company, also known as SpaceFab, is designing and building its first space telescope, scheduled for launch in late 2020. The satellite, called the Waypoint space telescope, will be available to the general public to take astronomical or Earth observation pictures, making it the world’s first dual purpose commercial space telescope. It can be used for astronomy when orbiting over the night side of Earth, and used for Earth observation when orbiting over the daylight side, about 40 to 50 minutes on each side. Anyone will be able to buy observation time and “task” the space telescope to take pictures of the Earth or the sky. Archived low resolution pictures will be free. Tasked high resolution pictures will be low cost, allowing a large variety of public and private customers to use it for education, amateur and professional astronomy, market research, environmental monitoring, mineral prospecting, and more. There are asteroids that should contain pure metal alloys of nickel steel. This nickel steel can be used to make metal objects, tools, and machinery, because it has strength similar to many types of steel that are used here on Earth. SpaceFab estimates that over 50 billion tons of steel have been produced on Earth since the beginning of the Iron Age. The largest metal asteroid, 16 Psyche, weighs over 2 quadrillion tons, potentially containing 40,000 times more steel than has been produced on Earth. SpaceFab wants to be the first company to make use of this vast metal resource, enough to last for millions of years. The company thinks that it will not be feasible to extract platinum and other precious metals from asteroids for a very long time. The platinum concentration in metal asteroids is expected to be less than .01%, so SpaceFab’s focus is on the industrial use of asteroid metal. SpaceFab’s fundraising is unusual. They are the first US space company to raise funds using the JOBS Act’s Title III Regulation Crowdfunding program approved by the Securities and Exchange Commission in May 2016. They are currently raising a seed round of funding through Wefunder.com, which allows anyone around the world to invest and own a part of SpaceFab. 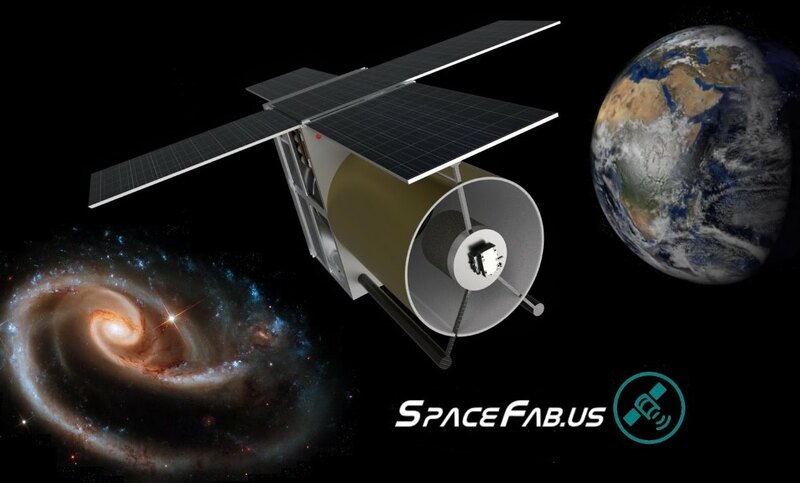 Founded in 2016, SpaceFab.US is a New Space startup located in Orange County, California, working on space telescope satellites, asteroid mining, and space manufacturing. We are designing our first space telescope, scheduled for launch in 2020. The co-founders are Randy Chung, who has worked at Hughes Aircraft, Western Digital, Rockwell Semiconductor, and Conexant, and Sean League, who has worked at nLight, MCI Worldcom, and Nortel. Together, we have over 50 years of experience in electronics, computers, software, cameras, telescopes, and astronomy. Visit us at our website – www.spacefab.us – follow us on Facebook+SpaceFab and Instagram+SpaceFab, and find out more about our crowdfund investment campaign at Wefunder+SpaceFab. Computer rendering of SpaceFab.US’s dual purpose Waypoint Space Telescope cubesat for astronomy and Earth observation, with telescope optics and solar panels extended. Orange County, California-October 9, 2017- SpaceFab.US is a new space startup company working on space telescope satellites, asteroid mining, and space manufacturing. The company, also known as SpaceFab, is designing and building its first space telescope, scheduled for launch in late 2019. The satellite, called the Waypoint space telescope, will be available to the general public to take astronomical or Earth observation pictures, making it the world’s first dual purpose commercial space telescope. The satellite is a standard cubesat size when launched. Once in orbit, the telescope optics extends, making it more than twice as long. This extendability is unique for a space telescope, giving it the highest resolution possible for its size and cost. SpaceFab plans to eventually have a constellation of the high resolution Waypoint space telescopes, used for astronomy when orbiting over the night side of Earth, and used for Earth observation when passing over the daylight side. After establishing their space telescope business, SpaceFab will focus on their next big goal of mining asteroids. While other asteroid mining companies plan to mine water from asteroids, SpaceFab is focusing on asteroid metal. There are asteroids that should contain pure metal alloys of nickel steel. SpaceFab estimates that over 50 billion tons of steel have been produced on Earth since the beginning of the Iron Age. The largest metal asteroid, 16 Psyche, weighs over 2 quadrillion tons, potentially containing 40,000 times more steel than has been ever produced on Earth. SpaceFab wants to be the first company to make use of this vast metal resource, enough to last for millions of years. Manufacturing in space is their long term goal. They want to provide everyone the ability to make their own metal objects in SpaceFab’s factories. The objects can be simple parts, turned into tools, or assembled into complex machinery. They plan to send a small general purpose factory to a metal asteroid, where it can process the raw chunks of pure metal into basic parts, then assemble the parts into equipment and machinery. The space factory would build equipment for customers, and at the same time, build additional machinery to increase the factory’s manufacturing capacity. Founded in 2016, SpaceFab.US is a New Space startup located in Orange County, California, working on space telescope satellites, asteroid mining, and space manufacturing. We are designing our first space telescope, scheduled for launch in late 2019. ORANGE COUNTY, California-October 3, 2017- SpaceFab.US is a new space startup company working on space telescope satellites, asteroid mining, and space manufacturing. The company, also known as SpaceFab, plans to launch its first space telescope late 2019. The satellite, called the Waypoint space telescope, will be available to the general public to take astronomical or Earth observation pictures, making it the world’s first dual purpose commercial space telescope. It can be used for astronomy when passing over the night side of Earth during each 90 minute orbit, and used for Earth observation when passing over the daylight half. 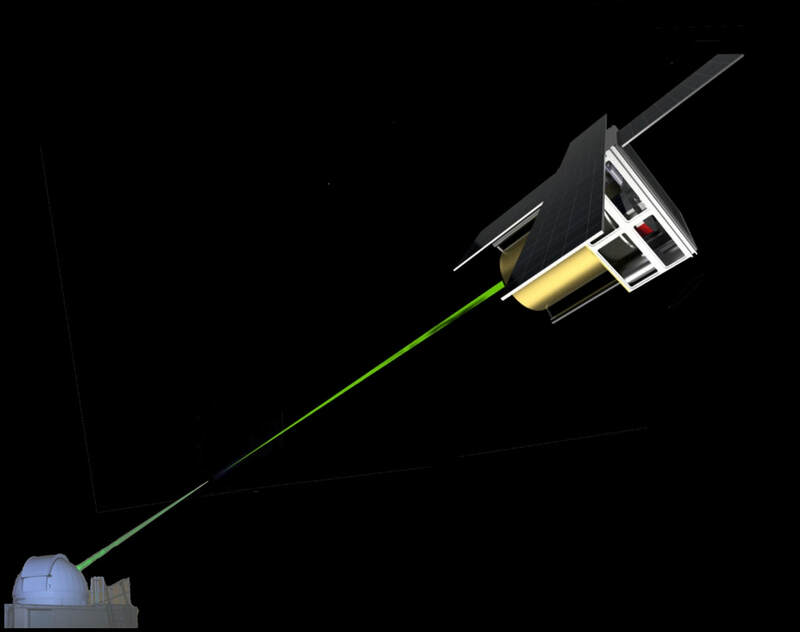 The Waypoint space telescope uses an exceptionally light and compact Corrected Dall-Kirkham design with a 21 cm primary mirror. The satellite is a standard 12U cubesat size (each cubesat unit is one liter in volume) when launched. Once in orbit, the secondary mirror extends, making it more than twice as long. This extendability is unique for a space telescope, giving it the highest resolution possible for its size and cost. It will be three to thirty times less expensive to build and launch than other space telescope satellites with similar resolution, because it saves millions of dollars in construction and launch cost. Other small space telescopes typically only have one camera, but the Waypoint satellite has three cameras: a 48 megapixel main camera, an image intensified EMCCD (Electron Multiplied Charge Coupled Device) camera, and a 150 band hyperspectral camera. 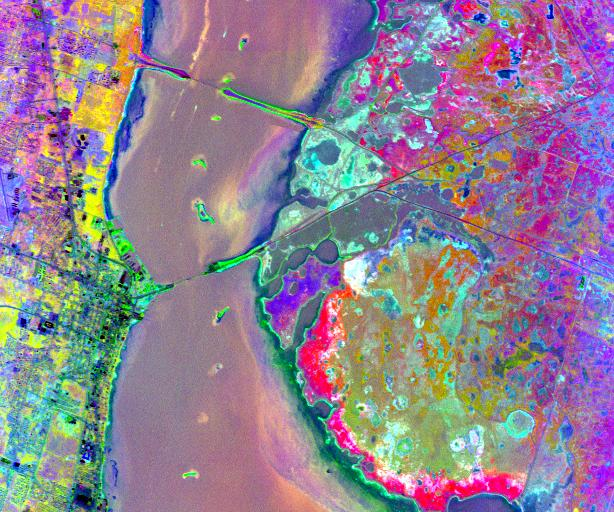 When imaging the Earth, it will provide panchromatic and four color multispectral imagery with 1 meter resolution in super-resolution mode, along with 3 meter resolution hyperspectral imagery. When used for astronomy, the space telescope has 0.6 arc second resolution. It has a special set of filters for ultraviolet, visible, and near infrared astronomical imaging of stars, galaxies, and asteroids. It also has an image intensified camera for taking pictures of faint objects. The satellite uses laser communication for downloading imagery, saving almost a million dollars in radio frequency licensing costs. The company plans to build several optical ground stations for receiving the satellite data and already has an agreement to locate one at a university’s observatory site on the west coast of the US. Anyone will be able to buy observation time and “task” the space telescope to take pictures of the Earth or the sky. Archived low resolution pictures will be free. Tasked high resolution pictures will be low cost, allowing a large variety of public and private customers to use it for education, amateur and professional astronomy, market research, environmental monitoring, and more. After establishing their space telescope business, SpaceFab will focus on their next big goal of mining metal asteroids for industrial metal. There are asteroids that should contain pure metal alloys of nickel steel. This nickel steel has strength similar to many types of steel that are used here on Earth to make metal objects, tools, and machinery. SpaceFab estimates that over 50 billion tons of steel have been produced on Earth since the beginning of the Iron Age. The largest metal asteroid, 16 Psyche, weighs over 2 quadrillion tons, potentially containing 40,000 times more steel than has been produced on Earth since the beginning of the iron age. SpaceFab wants to be the first company to make use of this vast metal resource, enough to last for millions of years. The company thinks that it will not be cost effective to extract platinum and other precious metals from asteroids for a very long time. The platinum concentration in metal asteroids is expected to be less than .01%, so SpaceFab’s focus is on the industrial use of asteroid metal. Manufacturing in space is their long term goal. They want to provide everyone the ability to make their own metal objects in SpaceFab’s factories. SpaceFab plans to send a small general purpose factory to a metal asteroid, where it can process the raw chunks of pure metal into basic parts, then assemble the parts into equipment and machinery. The space factory would build equipment for customers, and at the same time, build additional machinery to increase the factory’s manufacturing capacity.